Patrick was the manager of a bustling, chaotic high-end restaurant, working himself to his wits end. One night, he served a drink to a long-time customer. That drink would change Patrick’s life path forever. Broken and seeking answers, he was guided to the lakeside on a beautiful summer day. As he sat in silence, he was led down a path of life’s deepest mysteries, which ultimately revealed the miracle right before his eyes. His path of awakening had begun. With willingness and openness, Patrick shares his mystical experiences. As he allows insights to unfold, his mind and heart open to further mystical experiences that weave through the fabric of our lives. Join him on his journey. 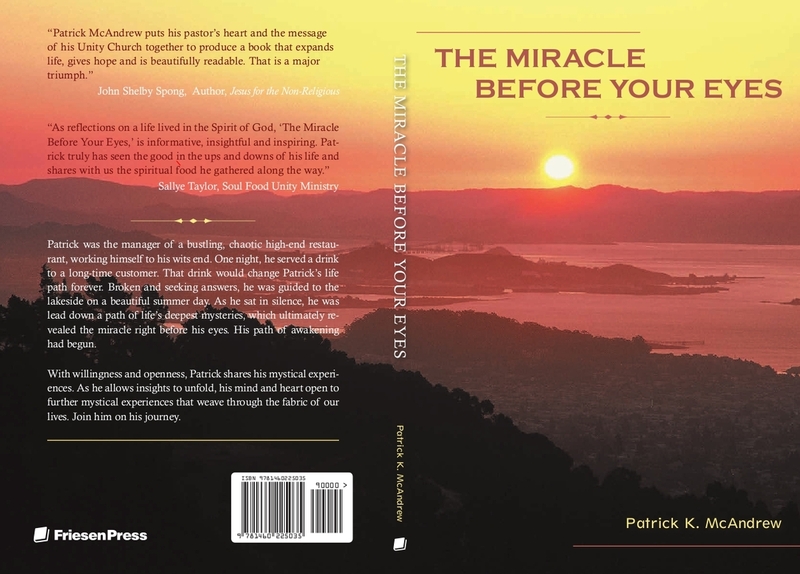 The Miracle Before Your Eyes is published by Friesen and is available through our Unity Spiritual Life Center’s Bookstore (email - unityslc@msn.com - or pay through our online donation button with a note.),. It is also available at http://www.friesenpress.com/bookstore, Amazon.com, and wholesale for Bookstore or church through Ingram books. It is available in hard and soft cover as well as two electronic versions (e-book). For ministers and licensed teachers this book could be 18 prewritten lesson based on Universal Principle with new and unique stories that reveal the ways of Spirit in a personal and profound way. It could be the basis for a fall or spring class series. The book is Biblically based and soundly founded on Unity teachings. No Evil: You’ve Got To Be Kidding! 1989 when Unity in Chicago moved to Thome Ave. he was offered the opportunity to teach a “What is Unity Class,” and he found his soul’s calling: to study spiritual truths and share It’s wisdom. Also in 1989 he was led to go to a workshop called What You Can Feel, You Can Heal, presented by Dr. John Gray. This workshop provided Rev. Patrick the opportunity to do some very deep soul work and provided the foundation for Rev. Patrick calls Conscious Living. The information tied very well with what he was learning through Unity Spiritual Education and Enrichment Program. Rev. Patrick applied to ministerial school and began studies in 1995. Rev. Patrick graduated from Unity’s Ministerial School in 1997 where he received the James Dillet Freeman Award as the ministerial student who best exemplified Unity Ministerial Consciousness. After graduating from Ministerial, Rev. Patrick had the opportunity to attend the Educational Institute in St. Louis and studied Maieutics with William Dols. Rev. Patrick blends this unique way of studying the Bible with his deep love of Metaphysical Bible Interpretation, which causes a Bible story to come to life. It has also provided him the foundation to see that most inspirational movies like Star Wars, or Avatar, or the Butler have within them a deep roots in spiritual Truth. Since his graduation from Unity Institute, he has served on the Licensing and Ordination Committee for Unity Institute for 10 years. He also served the Field Licensing Committee for 10 years and has mentored three ministerial candidates through this Unity Worldwide Ministerial Education Program. He attended Unity Executive Institute in 2002; Be Peace Workshops in 2008; and the Art and Practice of Living With No One Against You in 2009. Rev. McAndrew holds a BS degree in Psychology and Business Management from James Madison University and has 21 years of managerial experience: 11 years in restaurants and 10 years in the transportation industry. Rev. Patrick wears many hats at Unity Spiritual Life Center, in Oklahoma City, where he has served as minister for the past 14 years. One of the most noteworthy is that he leads many of the Spiritual Education classes at the church. Having passion for the Truth, Rev. Patrick uses humor, creativity, imagination, and references to television, movies and cinema plus his own personal experiences to illustrate many of the lessons. Rev. Patrick is noted for breaking down passages and restructuring them in a way that "speaks to you and be clearly understand" resonating from inside to the out. His favorite authors are Eric Butterworth, Ernest Wilson, Joel Goldsmtih, Imelda Shanklin, Myrtle Fillmore, and Emilie Cady.